After Moses received the commandments on Mount Sinai, Scripture says that he “took the Book of the Covenant and read it in the hearing of the people” (Exodus 24:7). Immediately, the Children of Israel responded by saying, Kol asher diber Hashem na’aseh v’nishmah — “All that the LORD has spoken we will do, and we will hear.” They immediately resolved to submit to the voice of the Holy One and live within the parameters set forth for them as a redeemed people. However, as we know, this resolve did not have lasting results. Shortly thereafter, their Redeemer quickly took a back seat to the egel hazahav, the golden calf. It seems that within both Judaism and Christianity, this has been the struggle of our spiritual existence ever since. James, the brother of our Master, reminds us that even after the coming of Messiah, his followers continued to struggle with the same duplicity. He commissions the disciples of Yeshua to “be doers of the word, and not hearers only, deceiving yourselves. For if anyone is a hearer of the word and not a doer, he is like a man who looks intently at his natural face in a mirror. For he looks at himself and goes away and at once forgets what he was like. But the one who looks into the perfect law, the law of liberty, and perseveres, being no hearer who forgets but a doer who acts, he will be blessed in his doing” (James 1:22–25). Do we, as Believers, struggle with these issues even today? 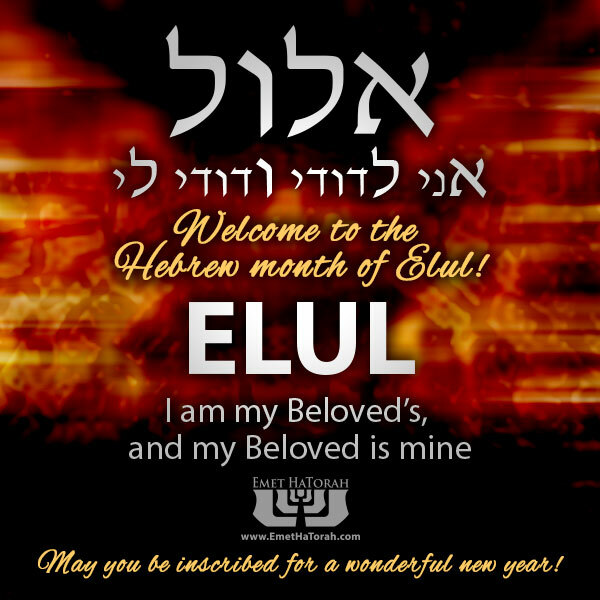 Happy Elul, everyone! May you be inscribed for a WONDERFUL new year! 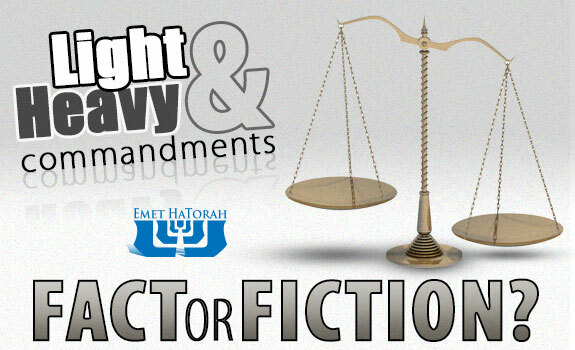 Light & Heavy Commandments - Fact or Fiction? Judaism claims that within the boundaries of Torah there exists the concept of precepts which are either “light” or “heavy.” Of the six hundred and thirteen enumerated commandments, there are those which fall into the category of being a “light” commandment and those which are considered to be “heavy.” Rabbi Judah proposes that there should not be a difference between the observance of the two. But does this distinction truly exist? Are there such things as light and heavy commandments? Don’t they all “weigh” the same? Citing James 2:10, Christian apologetics teach that if you’ve broken one, then you’ve broken them all. “For whosoever shall keep the whole law, and yet offend in one point, he is guilty of all” (KJV). As a matter of fact, there is currently an evangelism curriculum which uses this reasoning to lead people into confessing their sinfulness and subsequent need for a Redeemer. They barrage their target with a series of questions designed to elicit a confession of guilt for breaking at least one of God’s commandments. From there, they use this passage in James to point out that that offense was not an isolated event and that they have been marked as a “sinner” and are in need of a Savior, because they have, in effect, broken all of God’s commandments. If this understanding holds true, then there is no such division between the “light” and “heavy” commandments, for they are all the same in the eyes of God. According to this theology, if we break even the least of the commandments our souls are in danger of the flames of Gehinnom. Editor's note: This article was originally scheduled to appear in the Messianic Times the week before Passover, but did not appear due to unforeseen circumstances (hence the reference to Passover). James, the brother of our Master, reminds us that even after the coming of Messiah, his followers continued to struggle with the same duplicity. He commissions the disciples of Yeshua to “be doers of the word, and not hearers only, deceiving yourselves. For if anyone is a hearer of the word and not a doer, he is like a man who looks intently at his natural face in a mirror. For he looks at himself and goes away and at once forgets what he was like. But the one who looks into the perfect law, the law of liberty, and perseveres, being no hearer who forgets but a doer who acts, he will be blessed in his doing” (James 1:22–25). Do we, as Messianics, struggle with these issues even today?